In That One Moment by Terese Lorae Smauldon, readers are introduced to Lia, Dee Dee, Rena, and Jas, four friends dealing with different issues in their lives. These women have the task of coming to terms with decisions that cannot be ignored. Lia is a half-black, half-Korean beauty that is used to the finer things in life. She is a VP for Virgin Records and has everything she needs except a love life. Ty is a new tenant in Lia's building that she cannot stop thinking about. Ty is a businessman that has his life together but who is also looking to settle down. Will both give in to the attraction they feel for each other? Dee Dee is married to a wonderful man but not satisfied. Dee Dee's husband, Deron, has been distant making her question their union. When Dee Dee's ex-boyfriend, Manny, comes back around she is faced with a harsh decision. Will she make the right one? Rena is a professor at a well-known university, a mother, and living with her boyfriend, Tak. The couple seems to have it all until Tak makes a decision that changes everything. Jas has been dealing with some painful memories from her past. Those memories have controlled a big part of her life until she meets Asaji. Asaji is everything she wants and needs in a man, but Jas's issues are causing problems. That One Moment is a story about friendship, family, and acknowledging true love. The characters were well developed giving readers a realistic look into their lives. The author did a wonderful job in creating a believable storyline that is thought provoking yet entertaining. I could not put this book down. I look forward to reading more from this author. I recommend That One Moment to others. 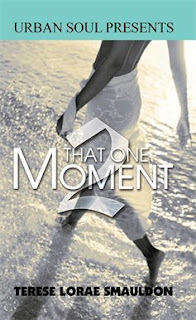 In book two of That One Moment, by Terese Lorae Smauldon, readers revisit Lia, Dee Dee, Jas, and Rena, four friends dealing with new issues. What goes around comes around and these four women find this out the hard way. Lia has moved to Chicago, with husband Ty, and she could not be happier. Lia's only concern is her mother-in-law's criticisms and her rude behavior. Lia and Ty have family over for dinner and when an uninvited guest arrives Lia and Ty's lives change forever. Jas is trying to adjust to being a celebrity's wife. Asaji is busy promoting his career and trying to keep his wife happy. Jas receives a phone call from her younger sister and soon realizes she may have bitten off more than she can chew. If dealing with her sister is not enough Jas must face her insecurities in her marriage. Rena is still trying to come to terms with her failed marriage. She is adjusting to being a single mother and believes she has everything under control. Tak still loves and misses his wife, Rena, but cannot get over what happened between them. However, Tak is fighting with himself about information that he has kept from Rena. Will she forgive him once his secret is revealed? Dee Dee is having a hard time getting over her ex-husband, Deron. Dee Dee refuses to believe he has moved on with his life. Dee Dee finds an outlet to cope with her pain, but it also starts her on a destructive path. When all is said and done, Dee Dee will have to deal with the consequences. That One Moment 2 is a page-turning book of peer excitement. The characters are dealing with bigger issues than in Book 1 that calls for harder decisions. The author gives readers a different look into the lives of these four women's stories. That One Moment 2 was full of entertainment, suspense, and drama until the end. I could not put this book down for fear of missing something. I recommend That One Moment 2 to others.